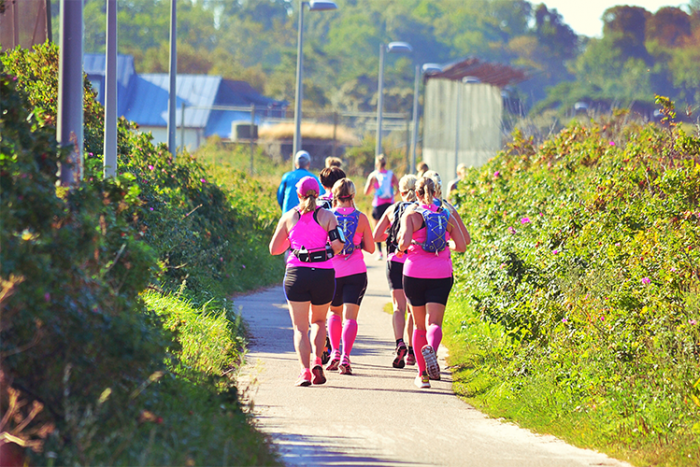 3 ways to combine running and a good cause! We all know jogging is an amazing sport, but how about taking this activity to the next level? While jogging is usually a solo sport, it can also turn into a social activity that can help you give back to your community. Here are some ideas to shake up your routine, while making your jogging session benefit everyone. Some say this activity, also known as “plogging”, is THE fitness trend of the year, while others simply see it as a fun way to do their part for the environment. A portmanteau combining “plocka upp” (“to pick up” in Swedish) and “jogging”, this activity consists in clearing parks and jogging paths of trash while on a run. Whether you’re with friends or family, load up on trash bags, go for a jog through your neighbourhood and make it a more pleasant place. It’s great for interval training, and you can even throw in a few lunges now and then. Running as a group can really help keep your motivation up! In addition to giving you an opportunity to meet new people, working out with a group drives us to reach our objectives, share tips and encourage one another. By talking to your neighbours, social network friends and other joggers in your area, you’ll surely find some motivated jogging partners ready to take up a new challenge and get to know every inch of your neighbourhood. Whatever type of running you prefer or mood you’re looking for, it’s always easier to lace up your running shoes when we know there’s someone waiting for us, and push our limits when we have a fellow jogger to impress! Plenty of sporting events across the province enable participants to raise funds for various organizations. Whether this is your way of giving back or you’re looking to encourage your family or colleagues to raise funds, it’s first and foremost an opportunity to take up a challenge to help others. Theme runs, obstacle courses, team races, family courses, marathons… there’s something for everyone all year long! What’s more, you get to donate to a wide range of NPOs. Running for a good cause: it’s double the motivation! We believe it’s possible to do good in our community while following our passions. Join us and make a difference! For more information on the Fonds de solidarité FTQ and our commitments to local development, responsible investing and environmental protection, click here.